Maximinus II, as Augustus, AD 309-313. Bronze follis. Denomination : Bronze follis. Mint : Antioch, 7th officina. Date : issued ca. AD 310. Size : 22.7 x 24.0 mm. Weight : 7.42 grams. Reference : RIC VI, page 636, #113c. Grade : aXF. Brown patina. Obverse : Head of Maximinus right, with IMP C GAL VAL MAXIMINVS PF AVG around. 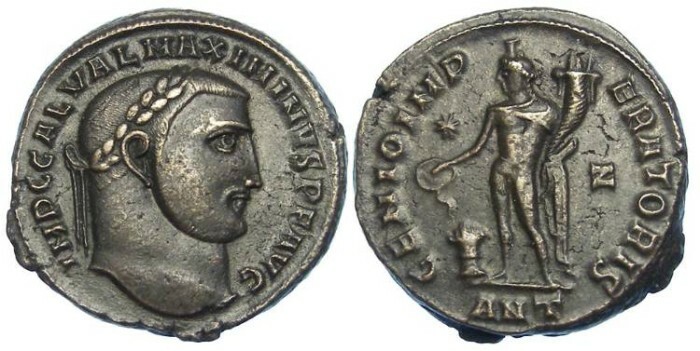 Reverse : Genius standing left wearing a modius, holding a cornucopiae and patera from which is is pouring on to an lited altar, with a chlamys over his shoulder, with GENIO IMPERATORVS around, the mint mark ANT below (Antioch), with the officina mark Z (7 th officina) and a star in the right field.